In October, Google(s goog) debuted Android 4.0, also known as Ice Cream Sandwich, for tablets and smartphones. The platform has two purposes: unify the software for use on both devices, and make the tablet experience better. Prior to Android 4.0, large Google tablets ran on version 3 of Android, called Honeycomb, but the overall effort seemed rushed and incomplete. Long time Android user Jason Perlow has run Android 4.0 on his Motorola (s mmi) tablet for the past two weeks and shared his impressions on Tuesday. Although I don’t currently have Android 4.0 on a tablet here, I’ve used Google’s platform for about as long as Perlow, and we both use a Galaxy Nexus phone, which runs the Ice Cream Sandwich software. I’m concerned, because Perlow is already finding usability issues with an Android 4.0 tablet. Perlow points out some of the same positives I’ve seen when using my new handset: The user interface is more consistent, elegant by comparison to prior versions and more responsive overall. I see that on my Galaxy Nexus on a daily basis. But even if Perlow didn’t point it out to readers directly, it’s clear to me there are still inconsistencies within Android 4.0 on different devices. 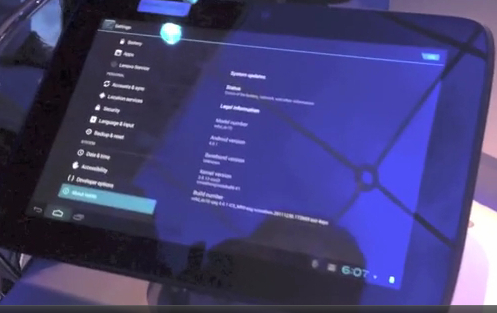 For example, at CES last week, a vendor was showing me an Android tablet running on Intel’s(s intc) new Atom chip. I asked if it was Honeycomb or Ice Cream Sandwich. He said the latter, but then I noticed the Apps button at the top right of the display. On my Android 4.0 phone, that button is on the bottom of the screen, so I questioned the tablet version. He checked, and sure enough, it was Android 4.0. Why would the same operating system have two different ways to access apps? Notifications on the tablet are on the bottom right, but on the top of the phone. How does this unify the platform? Perlow’s other main hang-up is the task-switching functionality in Android 4.0. I actually like it on my Galaxy Nexus, but I see his point about the purpose of the feature: It’s not clear to end-users how it works. Honeycomb used the same method, but it’s enhanced in Android 4.0. Swiping the tasks, at least on my Android 4.0 smartphone, simply removes them from the recently used task list. As Perlow says, you have to go to the actual task-killing function in Settings. An alternative I’ve found is a bit of a shortcut: Tapping and holding a recently used app provides an “App Info” option. Click it, and you’re taken to the settings for that particular app so you can kill the task. I’m not going to pass judgment on Android 4.0 for tablets until I get time to extensively kick the tires. I have an Asus Transformer Prime loaner on the way, so hopefully, I’ll be able to soon validate or refute what Perlow is experiencing. In the meantime, I’ll be looking to manually upgrade a Samsung Galaxy Tab 10.1 tablet to Ice Cream Sandwich to speed up my research. It’s clear to me Google has taken huge steps forward with Android 4.0. I interact with it daily on a phone that sees far more use than my iPhone 4S(s aapl). That doesn’t imply one is better than the other — we all have different needs — but it appears Google may not be able to rest on its Android 4.0 laurels just yet. Offering a seamless software interface between phones and tablets appears to be working quite well for iOS devices and the iPad in particular: There was never a learning curve for Apple’s tablet for those who had used an iPhone or iPod touch. All of these are potential areas of improvement for Android. But I don’t see how they make Android worse than iOS; many of these are features that are just tricky to implement right. Apple opted not to implement them at all for now (or to limit them), while Android implements them and then tinkers with them. Keep in mind that Android had both notifications and multitasking long before Apple, and Apple basically just copied Android once Android had come up with tood solutions. You are right about one thing that it still needs work(continuing Androids progression). But not in any of the areas you pointed out. First FB needs to fix the app not Google implement something to correct it. Second the minor UI differences work well on both platforms. I don’t want to be dragging down an over sized notification bar. Third let’s set this straight Google got it right with ICS. Apple is the one who needs some work. Check the UI design spec from Google before complaining. I understand your comments on core UI navigation but it just doesn’t make sense on a larger form factor. The learning curve is really minimal if at all, your still using the same visual cues (icons: home, back, apps) which triggers a known response, placement is not as significant. I’d like to also add, that ios is just a grid of icons….not much ui there, so comparing the ios ui to android is comparing apples to oranges….. It might be just a grid of icons, but it’s a UI nonetheless. There’s the movable grid, the dock, the top bar which provides access to the notification center and so on. When you’re using it you might think nothing special of it, but that doesn’t mean there’s not much UI there. UI is as much about what is there as it is about what isn’t. Note also that this blogpost didn’t say anything about widgets, which is the biggest differentiator between the iOS and Android homescreens. The agenda you have is trying force an ios centric idea of what a mobile ui and os is supposed to be. Let android be android and ios be ios and metro be metro. I do not want my android devices to look like any of those other devices. Further, when Jason state early on in his article that fandroids don’t need to bother telling him to stop using a task manager, it is a very telling statement that he is indeed biased, a moron, or both. And no, i’ve commented on enough clickbate articles (yours) for the day, so don’t tell me to post that in his comments. yes he was commenting on pre release and homebrew versions of 4.0, you said so yourself…..4.0 is only launching today. If you want an ios experience device, get an ios device and give me your android gadgets…..
We can debate semantics on builds if you’d like (I’d rather not) but it sure sounds to me like Jason’s current build is the official release. Thanks! The build I am using, IML77, is in fact the official Motorola release. So he was using pre release software not directly provided by the oem, how did he get it on there? Did he wipe data/cache, wipe dalvik cache, and fix permissions? I’d respond directly to his post below, but thats not avialable. You supposed expert tech bloggers are pushing an agenda. Dan, what agenda do you think I have? Apple iOS? Something else? Personally, I don’t care what mobile devices anyone buys because they’re spending their own money, not mine. And as far as me spending mine, most of my purchases for the past 2+ years have been on Android devices: A 7″ Galaxy Tab that I use daily, a full priced Nexus One that I bought on day of launch and a Galaxy Nexus I paid full price for and had shipped from the UK to the US. So exactly *what* is my agenda here? As far as Jason’s flashing method, I can’t speak to that. But I’ve flashed well over 100 custom ROMs on my devices (as noted by the many blog posts here in the past two years). Please don’t diddle with process questions about wiping cache and such. I’d like to also know if he used a md5 sum checker to verify that the file of what ever he flased over wasn’t corrupt…..again the devil is in the details which both of you conveniently leave out. And what do you think you’ll find in the details, Dan? That somebody has tampered with the code to move the notifications to another place? I’m sorry, but that’s just nitpicking to the limit. If this were a blog post about slow performance and buggy software I would side with you, but this is about UI decisions. They may have used prerelease software, but a quick glance at the actual release version shows that this it works exactly the same. And I don’t think a corrupt file will magically make a notification bar move from the top to the bottom right. In that article he mentions that his apps were buggy….thats why i mention the the process stuff and the possible file corruption. As far as common sense goes John….you tech bloggers lost that along time ago along with your credibility. The agenda you have is trying force an ios centric idea of what a mobile ui and os is supposed to be. Let android be android and ios be ios and metro be metro. I do not want my android devices to look like any of those other devices. Further, when Jason state early on in his article that fandroids donâ€™t need to bother telling him to stop using a task manager, it is a very telling statement that he is indeed biased, a moron, or both. And no, iâ€™ve commented on enough clickbate articles (yours) for the day, so donâ€™t tell me to post that in his comments. Obviously, the comments about the lack of uniformity do not make sense. It seems the aurhor of the article knows little about user experience and human-machine interfaces. I usually hold my tablet by the bottom of, so it makes more sense to have notifications on the bottom which I can access with just a movement of my finger. Form factor is important when it comes to design the best user experience. Appreciate your comment Joan, but the iPad’s uniformity says otherwise. As a sidenote: I was a QA Software Manager for a number of years at a Fortune 100 company and had heavy interaction with our HCI or Human Computer Interaction testers in all project phases. ;) I’m not an expert by any means, but I have experience in the area. What you say makes sense about notifications, personally I prefer them atop the display so they stand out to my eye more; i.e. : I’m generally looking at the top half of a tablet with my eyes, not the bottom half. Thanks! Don’t you remember when the iPad came out? People were calling it nothing more than a big iPod Touch, and they were as right then as they are now. Apple could have made the iPad a much better product, but they chose not to so they could have this unified UI. By doing so they missed out on a lot of opportunities. It’s not that it doesn’t work, it’s just that it could work better. But in the end even Apple had to make some adjustments. The Split view controller for example, or the way modal view controllers don’t take up the entire screen on the iPad. Makes me think of the reverse case, where Microsoft tried to copy the basic interface of Windows onto the cellphone and producing the utter crap that Windows Mobile was. Everything was cramped up because, back then, they didn’t understand smaller screens need different ways of displaying interfaces. The uniformity in Android 4 is on the API side of things. A raft of improvements make it possible for developers to write a single app that will work well on tablet and phone without the need to cut different flavours for the two form factors (that is the theory anyway!). Ironically, this may actually result in a less uniform experience from the end user’s perspective because the exact same app may look significantly different when run on their tablet and their phone. Tablets and Phones have different form factors. A 7 to 10 inch screen is used differently than a 3 to 4 inch one. It’s normal to have differences between the tablet and phone versions of an OS and in my opinion it shows that more thought has gone into it. On a tablet screen there’s actually room to make the bottom bar useful, so they added notifications and a small task bar to it. On a phone’s screen there’s just not enough room to add the default buttons as well as the task bar so they put the notifications on the top and made a pull out task bar. That’s just how these things work, you can’t have a completely unified experience between a tablet and a phone without having either the feeling that space is too cramped or that everything is too far apart. Hmmm. Tech blogger find pre-release homebrew OS release has less than perfect performance and tuning. News at 11. The thing you said about the difference between the phone and tablet interface isn’t really fair. The interface is unified, but it wouldn’t make sense to stretch out the phone navigation tools. It still has the same software keys and notification tray, they’re just positioned differently to make used of the screen size. Personally I think it’s a great idea. Joe, making better use of a larger display makes total sense to me. Having notifications, settings, menus and other core UI functions in different places, not so much. It could be our individual preferences coming into play here and once I get 4.0 on a tablet, perhaps I’ll feel otherwise. Thx!